RIVERSIDE, Calif. — Researchers at the University of California, Riverside, have, for the first time, successfully used electric dipoles to completely suppress electron transfer in one direction while accelerating in the other. The discovery could aid development of improved solar cells and other energy-conversion devices and hasten the design of new and superb energy and electronic materials. It is not a stretch to say that life depends on strictly regulated electron transfer. Electron transfer is among the most fundamental processes for sustaining life and for energy conversion. It occurs when an electron moves from one atom or molecule to another, bringing its electrical energy with it. Photosynthesis, mitochondrial and cellular respiration, and nitrogen fixation are among the many biological processes made possible by the orderly movement of electrons. Because electron transfer is both ubiquitous and important, scientists have invested enormous efforts into understanding the process, and used what they learned to create solar cells, fuel cells, batteries and many other devices that also depend on efficient electron transfer. But the delicate electron ballet in living things choreographed through eons of evolution is more like stage diving into a mosh pit when applied to human-created technologies. Scientists can control electron transfer to some extent, but have difficulty herding all the subatomic particles into a single direction. When they direct electrons forward, inevitably, some move backward as well, causing a loss of energy. Valentine Vullev, a professor of bioengineering in the Bourns College of Engineering, led an international team of researchers from UC Riverside, Poland, the Czech Republic, and Japan that used molecular dipoles to harness electron transfer. Molecular dipoles occur when one of the atoms in a molecule has a composition that is more likely to attract electrons, which have a negative electrical charge. Molecular dipoles are everywhere and have powerful, nanoscale electrical fields that can guide desired electron transfer processes and suppress undesired ones. While electric dipoles generate enormous fields around them the strength of the electric fields decreases fast with distance. Therefore, it is essential to place the dipole as close as possible to the electron transfer molecules. 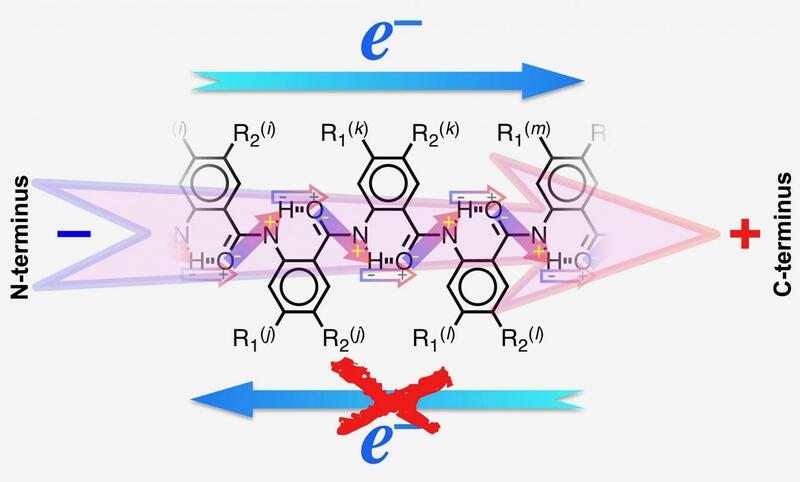 Vullev's group incorporated the dipole within the electron donor molecule, 5-N-amido-anthranilamide electret, a substance with a semi-permanent electric charge and dipole polarization, similar to a magnet. The researchers exposed the electret to different solvents to trigger electron transfer. With low-polarity solvents they considerably enhanced the effect of the dipoles and guided all the electrons in just one direction. This is the first time that scientists have shown that the dipole accelerates electron transfer in one direction and completely suppresses it in the other. "This discovery opens doors for guiding forward electron transfer processes, while suppressing undesired backward electron transduction, which is one of the holy grails of photophysics and energy science," Vullev said. The key lay in striking a fine balance between lowering the solvent's polarity to enhance the dipole effect without killing electron transfer all together. Custom-designed molecular components with the right electronic properties helped optimize this balance. "While it appears that we are solving an important physical chemistry and physics problem, the findings from our work can have broad interdisciplinary impacts, and prove important for pertinent fields, such as molecular biology, cell physiology, and energy science and engineering," said Vullev. "A better understanding of electron transfer at the molecular level will improve our understanding of living systems and serve as a foundation for efficient energy technologies." The report on this advance received the highest ranking by journal reviewers and was selected by the editorial team of Angewandte Chemie to be published as a "Hot Paper" in an upcoming issue.